If you’re looking to quit your job, start side hustles, create money machines, and own small businesses…you have to ask yourself, what’s the goal? Is it to make money, have cash flow, gain financial freedom, spend time how you want, or something else? I’ve been struggling with the single word or phrase that nails down the destination…and I think it’s best summarized as UNEMPLOYABLE. My friends and I have recently been joking that we’ve all become unemployable. A traditional job just simply could not provide the money, wealth, and flexibility we’re able to generate on our own. In this picture, I’ve drawn out that progression so perhaps you can relate to where you are today. Most people are in standard W-2 jobs. While in this position, you want to find a way to get the most out of that job. How can you get paid to fill critical skill gaps, make the right connections, and get hands-on experience where you need it? Modify your mindset from the mainstream approach to making money. Build, cultivate, and manage your people network <- the #1 factor to success in my experience. Take action every single day toward your goals. Rid yourself of procrastination, free up time and money, and constantly press on what matters. This is the journey my book Leave the Grind Behind covers. 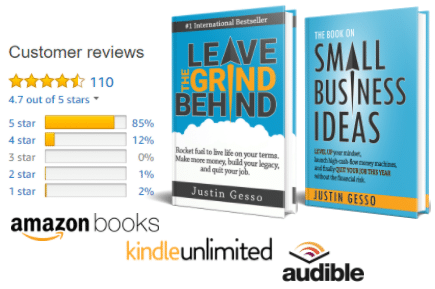 With over 100 positive reviews on Amazon, it has been motivating and guiding the journey out of the W-2 “cog” world. Next up is building in side hustles and money machines that begin to generate real cash flow and get you on your way to financial freedom. The best businesses are not complex. This means you can build a safety net before pulling the trigger and quitting your job. 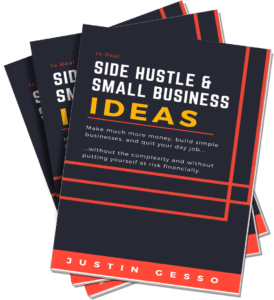 Small business ideas, side hustles, and money machines. How to analyze business ideas. How to launch and execute on them. Ultimately, there will be a point where it will become obvious what you have is working and that it makes more sense to quit your job than stay. My second book The Book on Small Business Ideas is all about this stage and will get from all the way to unemployable. Alright, having navigated the previous two journeys successfully, here you’ll land. You will have cash flow, financial freedom, assets building your wealth, and you’ll be able to spend your time working on what you enjoy. At this point, you will never go back…you are unemployable. And since your money is coming from passive, scalable sources…you want have to. Your assets have you set. Make it your goal to do this in 1 year or less. With technology and the global economy, it’s never been easier. We are in the modern-day gold rush.